Daintree Valley Haven: Where's dinner?! 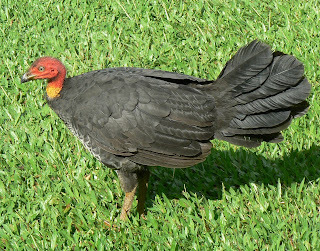 Heckle, the Australian Brush Turkey, is a regular visitor to the kitchen door and now takes bread out of our hands. And the word has passed to his missus, Jeckle, and their new offspring (so far unnamed) who also turn up for any offerings. We'd hoped this might divert them from flying up into the bananas and demolishing all the green fruit before it has a chance to ripen ... but I think we're being too optimistic! Lovely rain over the past week has really freshened everything up after such an unseasonally dry spell.